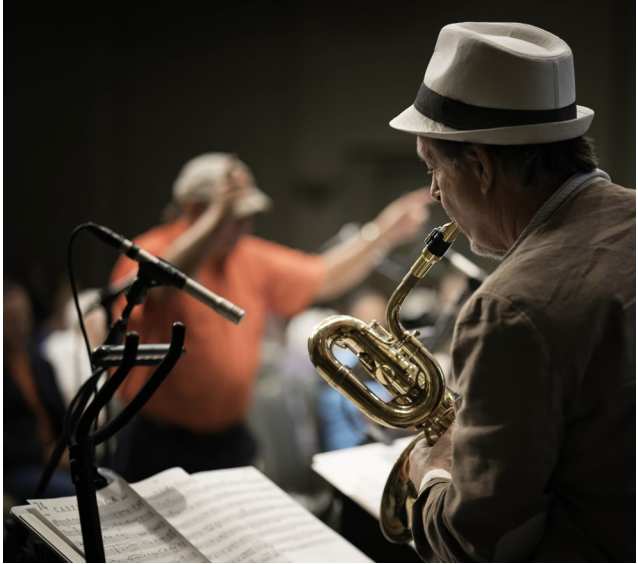 For all in the Marriott ballroom last July, the 2017 AKAA Reunion served up two nights of fine big band jazz played by a very familiar cast of musicians. Era band performances following the history of the Knights as they evolved into the band of today. AKAA President Woody Leonard started things off with his upbeat introduction of the ‘30s/’40s Band. With Ralph Black’s exceedingly smooth narrative, the ‘30s/’40s Band began the evening with their take on The Royalty of the Swing Era. Kicking things off with four consecutive Count Basie numbers, the band breezed through One O’Clock Jump; Alright, Okay, You Win; Blue Skies; and All of Me before moving on to the classic music of the Duke—Duke Ellington that is! Continuing on with Take the A Train, It Don’t Mean a Thing, I’m Beginning to See the Light, and Don’t Get Around Much Anymore, the band ably navigated their way through those well-known and iconic charts. Then, with Milton Welch supplying some tasty clarinet licks, the band charged into Benny Goodman’s Let’s Dance, Why Don’t You Do Right, Jersey Bounce, and Goody Goody before closing with Goodman’s classic, Sing, Sing, Sing. Throughout the show, fine vocals from Pat Lyle, Cathy Altonji, and Susan Grace provided a nice counterpoint to the band’s instrumentals. After a brief break, the ‘50s Band took the stage and opened their set with Marion Evan’s arrangement of Too Marvelous for Words before moving on to Rick Bell’s composition, Rick’s Ruff, with some fine tenor sax work from John Conner, Mike Lyle, and none other than Rick Bell himself! Bob Wright on trumpet and Kirk Schmidt on piano also joined the fray. After performing Jay Owen’s arrangement of Stars Fell on Alabama, the band welcomed vocalist Marilynne Myson to the stage for a sassy rendition of My Baby Just Cares for Me, followed by her take on Sentimental Journey. The band then shifted gears for a trombone feature, an adaptation of Charlie Ard’s Just Friends, before morphing into Jay Owen’s arrangement of The Odd Couple. Following that, the band played the tango, Milonga Del Angel, that featured Bob Greenhaw playing some sweet alto sax. Then, Marilynne Myson returned for Cry Me a River that featured succulent guitar work from Jonathan Harms. The band ended with their traditional closer, Thanks for the Memories. The ‘60s Band completed the night, starting with a nice rendition of Castle Rock that featured first-rate solos from Cecil Wilder, trombone; Bob Wright, trumpet; Bob Greenhaw, tenor sax; John Norton, piano; and Patrick Bruce, guitar. Then, Buddy Golson stepped to the mic for some nice trumpet work on Midnight Sun. Several more players demonstrated their prowess before Buddy wound things up. Reprising a tune from the Knights’ vintage album, Total Eclipse, the band played Walk on the Wild Side before moving on to the vocal chart, Black Coffee, featuring longtime vocalist Jane Drake. The band then dove headfirst into Eleanor Rigby followed by a nice rendition of Barbara that featured Cecil Wilder on trombone. Tackling the ‘60s standard, Proud Mary, the band beat that tune into submission before moving on to Henry Mancini’s Two for the Road, a number that featured several nice solos and vocals from Jane Drake. 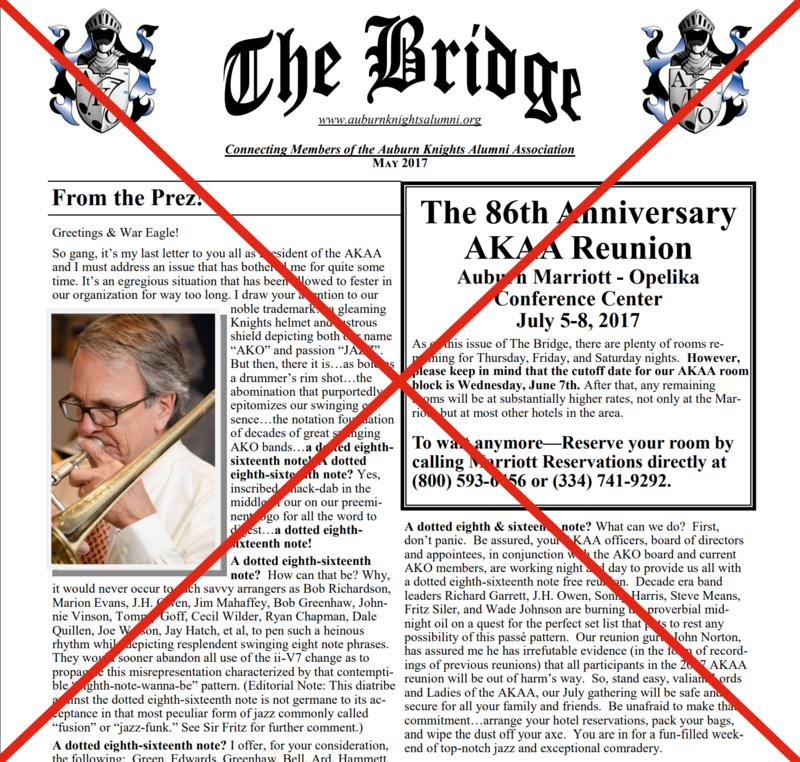 After Steve Means reminisced about the old Auburn Knights Alabama Cavaliers annual Battle of the Bands, the band kicked into Alabama alum Steve Sample’s arrangement of Rhumba Medley. Then, per tradition, the band closed with the familiar Ray Charles’ standard, I Can’t Stop Lovin’ You. As the ‘60s Band wound up the evening, the applause of the crowd made it clear everyone there had enjoyed a night of stellar music. Even better, Saturday night was yet to come. Opening their Saturday performance with a Woody Leonard arrangement, the ‘70s/’80s era band thundered through the appropriately entitled, 70s/’80s Medley, that featured nice solos from Joe Watson, trombone; Jonathan Harms, guitar; and Tony McCutcheon, vibes; against a backdrop of auxiliary percussion. Slightly shifting gears to honor the late Al Jarreau, vocalist Susan Grace came to the stage for a spirited take of Boogie Down with some tasty tenor from John Conner. The band then shuffled through Steely Dan’s Ruby Baby before tackling Rick Bell’s arrangement of St. Louis Blues, a tune that featured Cathy Bell Altonji on vocals and John Conner on tenor sax. Honoring the late Jason Passmore, a fine musician from Atlanta, the band then grooved through Rebellion, Ryan Chapman’s ode to Jason that also featured fine playing from John Conner, tenor sax, and Woody Leonard, trombone. Diving back into the archives, the band then charged into Does Anybody Really Know What Time It Is? with Joe Watson tearing it up on trombone. After All I Do is Dream of You with Neal Brumbeloe on vocals, the mood shifted to a more melancholy vein with Leon Russell’s A Song for You with Susan Grace on vocals and Bob Wright on flugelhorn. Sprinkling in some Latin flavor, the band played through a fine arrangement of Bésame Mucho that allowed several soloists to stretch their wings. The familiar strains of Bob Richardson’s Goin’ Home closed out the set. After a quick changeover, the 90s/2000s ensemble took the stage and got things rolling with Duke Ellington’s Take the “A” Train with Robert Maxwell on trumpet. Continuing with instrumentals, the band charged into You’d Be So Nice to Come Home To and Somewhere Over the Rainbow, an arrangement showcasing the searing trumpets of Ryan Blackwell and Ryan Chapman. Then, vocalist Clarke Williams grabbed the mic for Fly Me to the Moon, a chart that allowed Khari Lee to display his considerable alto sax chops. Nikki Rivers, attending her first reunion in quite some time, then sang a soulful interpretation of Since I Fell for You. The upbeat instrumental, Flight of the Foo Birds, came next with some fine sax licks from Brandon Kidd and Brad Evans joined by Carlos Rodriguez on trumpet. Tim Baur’s driving bass kicked off Dizzy Gillespie’s A Night in Tunisia, a nice ensemble tune with solos from several players. Brad Evan’s smooth tenor was featured on the ballad, September Song. Three vocals followed with Clarke on a lively take of Frim Fram Sauce, then Nikki on Don’t Get Around Much Anymore, then Clarke again on Ray LaMontagne’s You Are the Best Thing. The band closed with the classic, In the Mood. After extended riffing to introduce the band, the current Auburn Knights Orchestra kicked off their set with the upbeat Back in Blue Orleans before shifting to the Latin flavor of Chick Corea’s Spain, a performance showcasing Ryan Blackwell on flugelhorn & trumpet, Django Bruce on piano, and Josh Gillen on alto. Vocalist Alyssa Krienke then came to the mic for the vocals Ain’t Misbehavin’ and A Foggy Day. An instrumental of When You Wish (Upon a Star) featuring the trumpets of Ryan Blackwell and Wilson Childers followed, then the band kicked things up a notch with the 70s hit, Pick Up the Pieces. Django Bruce’s piano introduced the jazz standard, Bennie Moten’s Moten Swing, with fine solos from Jayson Perry, tenor, and Ryan Blackwell, trumpet. Shifting from trumpet to vocals, Ryan sang Suit & Tie before returning the mic to Alyssa for Georgia on My Mind. Sam Liaw’s sweet alto took center stage on Pure Imagination. Ryan then returned to the mic for Big Bad Voodoo Daddy’s Mambo Swing, aided by an army of percussionists rockin’ a terrific calypso beat. Smoothing things out, Alyssa returned for Nice & Easy, her final vocal of the evening. The band closed with Gordon Goodwin’s Count Bubba with terrific ensemble work and some rollicking tenor from Jayson Perry. 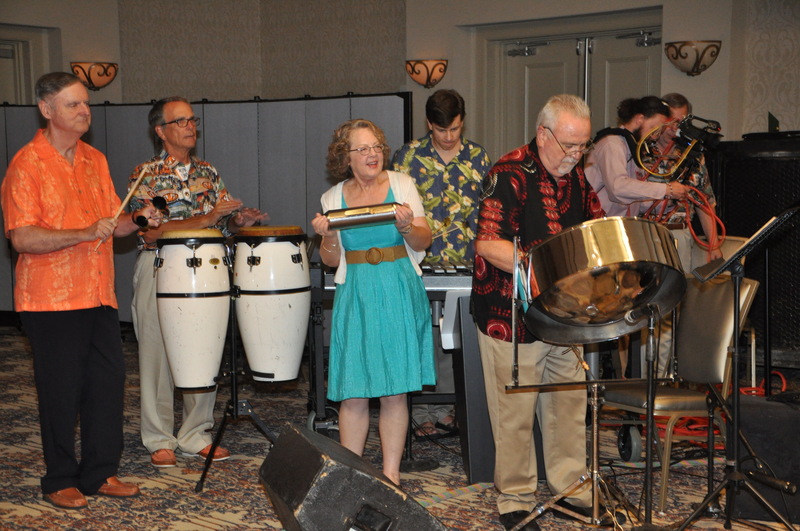 As in years past, the 2017 AKAA Reunion showcased terrific musicianship and six incredible bands. 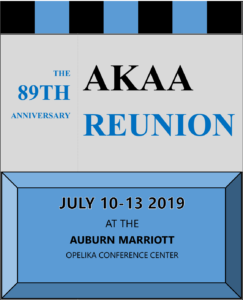 If you missed out, capture the experience by setting your sights on the 2018 AKAA Reunion, July 13th and 14th. See you there!